York, which was founded in 1874, started out manufacturing ice machines. Today, the company’s innovative heating and cooling products are used in many famous buildings around the world, including the Empire State Building and the Sydney Opera House. At Swan Plumbing, Heating & Air, we are proud to offer high-quality York home comfort products to homeowners in Denver and the surrounding area. Why Choose Swan for York AC Services? We are a locally owned business. As such, we know that our customers are also our friends and neighbors. That is why we have an unwavering commitment to providing only the best heating and air products and exceptional customer service. Or, click here to schedule your York air conditioning service online. 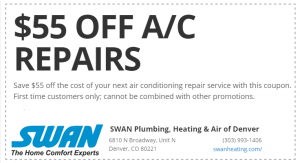 Swan has a reputation in the Denver area for dependable air conditioning repair services. If your York air conditioning should need repair, you can rest assured that one of our HVAC professionals will arrive promptly to diagnose the issue. Before we begin working on your AC unit, we will give you a written estimate detailing the cost of the repair. With Swan, you will never be surprised by hidden fees or charges. We also back our work with a warranty on both parts and labor. If a repair is not feasible, we can also give you an estimate for a York replacement air conditioning system. We are proud to service and install the York Affinity™ and York LX systems. These systems offer high efficiency, superior comfort control, and noise reduction technology. Why Install A New York AC System? Most homeowners choose to install a new AC system when their current system no longer cools efficiently or requires frequent repairs. These issues are common in AC units that are over 10 years old. Changes to the square footage or footprint of your home following a remodel or addition may also mean that your current AC is no longer adequate for your home. Good: These systems are the most budget friendly. They offer single-stage cooling for average performance and efficiency, which makes them an excellent option for cooling spaces that you do not use all of the time. Better: These mid-priced systems provide increased energy efficiency and comfort by offering options for single-stage and two-stage cooling. These units are the most popular among Denver homeowners. Best: These units are the best option if you want maximum performance and efficiency. These systems offer two-stage and variable-capacity cooling along with Energy Star efficiency. These systems are also the most expensive. The wide range of comfort options and price points means that we can help you find the right York air conditioning system for your home and budget. At Swan, we will never try to talk you into an air conditioning system that is larger, more expensive, or more efficient than you need. Even if your existing HVAC components are from another manufacturer, we can still help you find a York air conditioner that will integrate seamlessly with the rest of your HVAC system. Once you install a York air conditioning system, it is important to have it maintained by a qualified professional to keep it running efficiently and to extend the life of the unit. Our Swan Club Membership provides substantial discounts on routine tune-ups as well as repairs and installations. For more information, be sure to visit our Club Membership page for details.